I always thought this mouse was really beautiful. I’ve never heard of anyone who used it and haven’t myself so I can’t comment on it’s efficacy, but I thought you might like to see it. Thanks so much, everyone. Its been great hearing what you guys are using, and what helps and doesn’t, also taking this much needed break has been a nice way to step back and brainstorm a bit more about all things notcot and what’s important as well! Oh - forgot to add: I am using an ancient IBM M15 ergonomic keyboard. They’re noisy as hell and don’t have a numeric keypad, but they also split totally apart and can be “tented” slightly like the Goldtouch. (Search on www.clickykeyboards.com) Having the halves split by about 5-6 inches makes typing more comfortable for me. For mice I am switching between an early version of the Logitech Trackman and a plain old OEM mouse. I’ve been using the evoluent mouse for a year and it is really good. My wrist stopped hurting, since you don’t have to turn your wrist so much. It’s worth the money. One might ask if tools like this fixes the problem. My experience tell me that they only fixes the symtoms, for a while. But they can be really nice to have when you fix the real problem in your neck and back by exercise and better posture. I have the Evoluent vertical mouse and highly recommend it. I despise using normal flat mouses now and I don’t think that it is TOO ugly, especially compared to that keyboard. Regardless of its appearance it will do wonders for your arm. I’ve been using the Evoluent Vertical Mouse for the last year, and it has helped significantly. Granted, over use results in pains in the leading edge of your hand, as you are just moving the repetitive motions elsewhere. 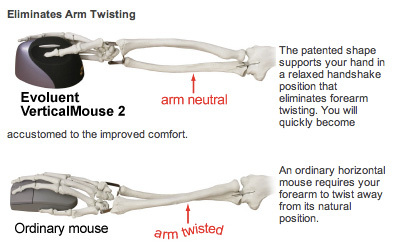 I tried every ergonomic mouse out there, and the Vertical Mouse is the only one I can recommend. That in combination with a Wacom Tablet has saved my career. You feel like a football player who’s torn his ACL, right? I solved the same challenge with this keyboard (http://www.typematrix.com) and got the Dvorak model — it’s taken me a year to learn to retype, but it’s worth it. I’m faster, my fingers move less, and I feel really cool — the whole point, right? Yeah i suffer from wrist pain also from 14 years of computer usage. i am still getting around to doing something about it.